At first glance it looks like any other tree. People pass by every day and don’t notice a thing. 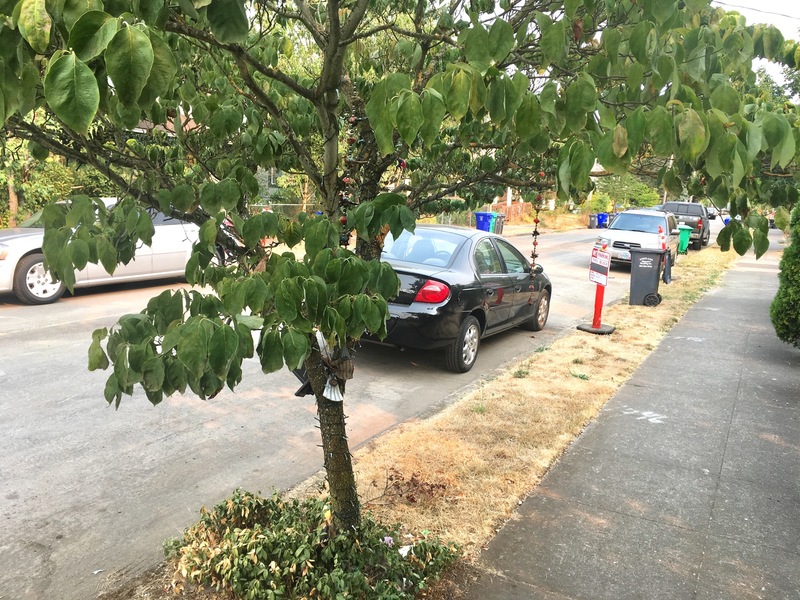 Like other street trees in the Foster-Powell neighborhood this one on SE 64th Avenue has branches, a trunk and leaves. 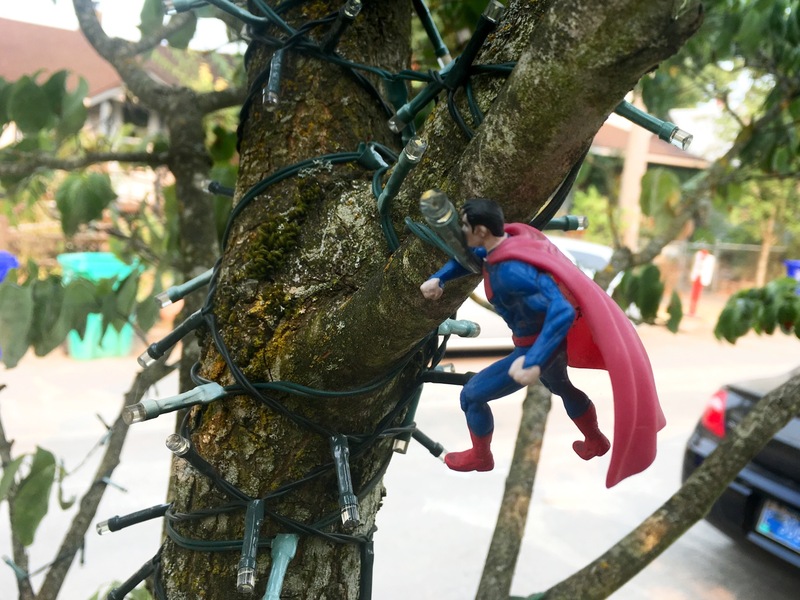 Within the canopy are objects that, with a bit of imagination, combine to create scenes that tell a story, albeit one that has the feel of a failed attempt at a DC or Marvel movie. Perhaps the unread, failed screenplay for the project featured an evil Tree Lord but he’s no where to be seen. I may have arrived too late, with the Tree Lord having fled after leaving the remaining characters frozen and stuck in the tree. This trunk contains visions of Dino Wars. 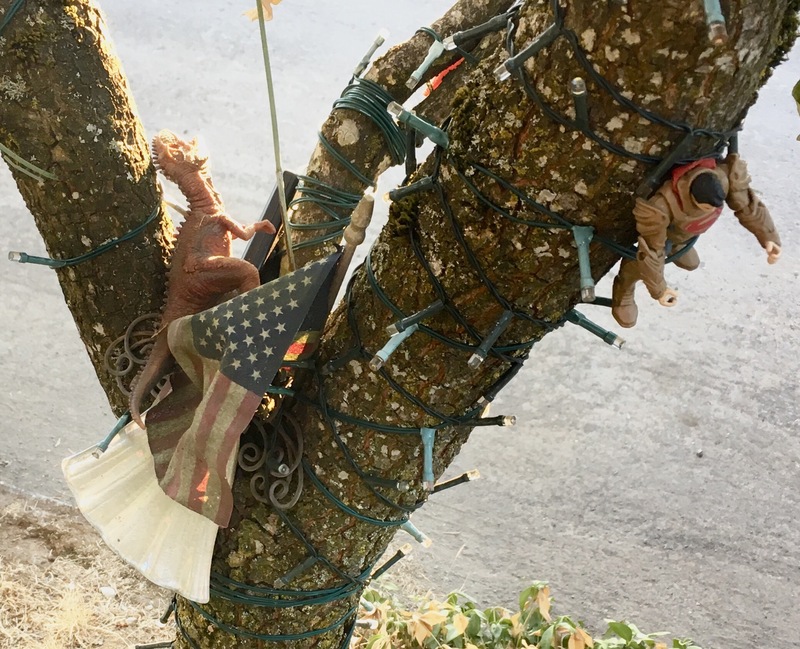 Scattered items allow a story to be pieced together, including relics of past Dino Wars, with Old Glory surviving the fray. Blame it on the Gamma Rays. Helplessness is not a trait I like to see in my Super Heroes. They’re strapped down by the decorative Christmas lights. While cheery and soothing at night and in season, they now appear menacing. Superman seems the most active as he thrashes away at unseen gamma rays in hopes of freeing himself. 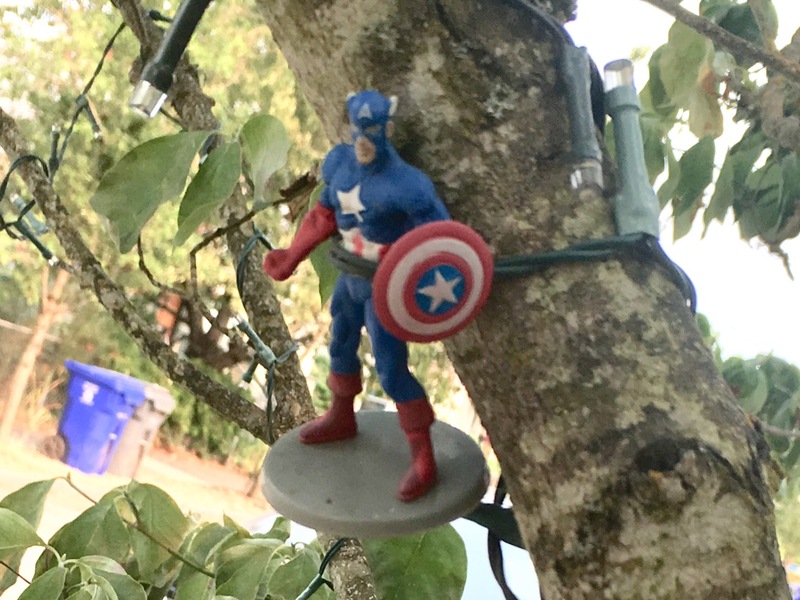 Captain America stands aimless on an old gray hoverboard. The string of lights remain tight around his chest offering him no chance for escape. Hovering in static perpetuity won’t allow him an opportunity to flee the tree. Lot of good that hammer does you. Thor seems the most burdened. A light cord binds his waist while his hammer hand is wrapped up at the wrist. This is a cliff hanger in suspended animation. I’d like to think that it won’t end but plastic weathers and Christmas lights break. 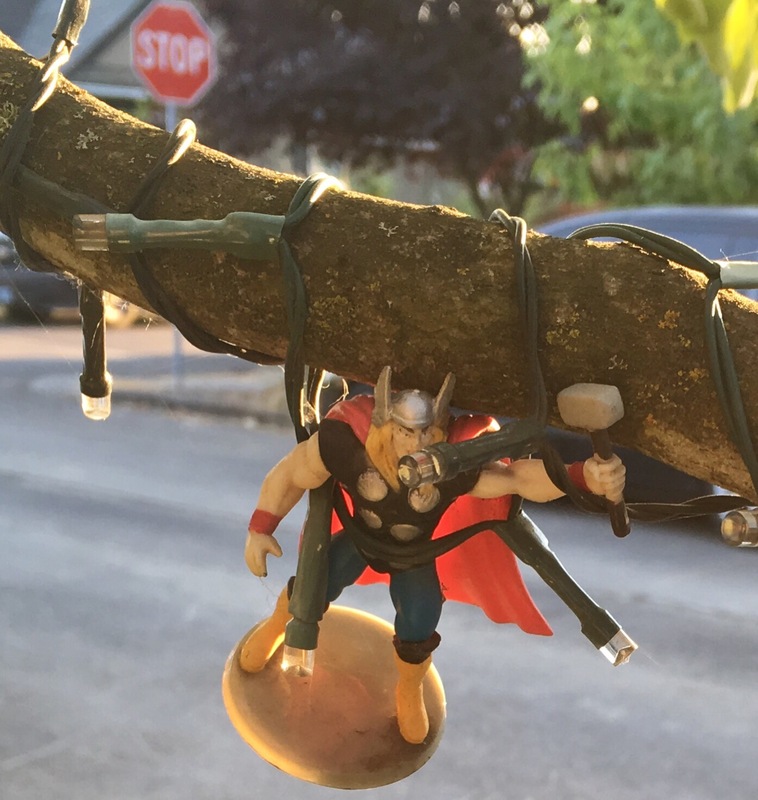 Thor’s freedom might come as the result of a lost limb. Our Super Heroes play a waiting game. What I’m attempting here is an appreciation for anyone who wants to decorate anything. 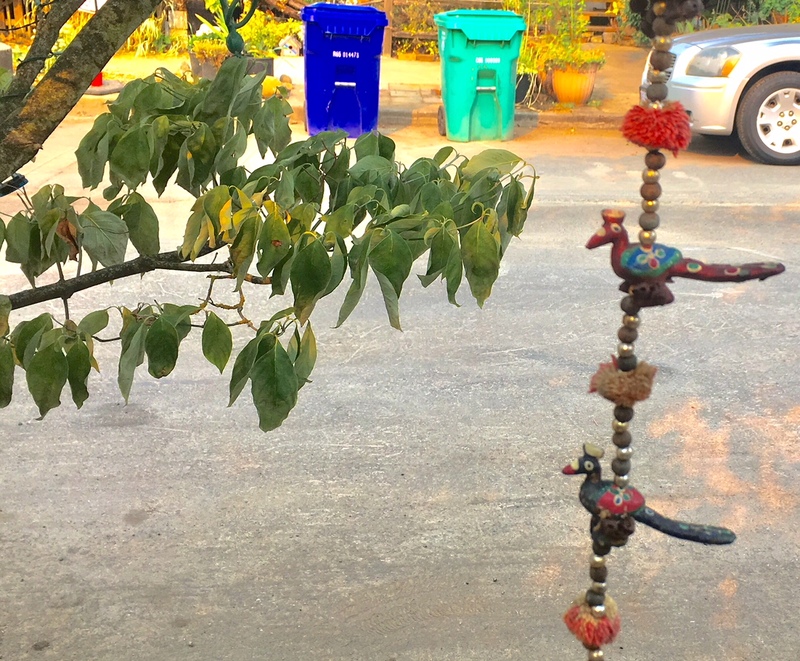 It’s not really a critique on drab neighborhoods where the lone decorated tree stands out. No one expects all the neighbors to be hard at work pouring every bit of creativity they can muster into yard art, tree art and pole art on the off chance that I might stroll by and see this brilliance through my bug eyed, quivering peepers but I will find these subtle explorations of found art camouflaged in street trees when they appear and sing their praises. The Foster Files: Can the Phoenix Pharmacy Rise Again? You’re right. Pretty good for such a small tree.